In a commercial kitchen, a portion control scale is a necessity. Selling a 12 oz. steak when your menu price is based on a 10 oz. portion means that for every five steaks you serve, you’re giving one away. That’s lost profit. And when the error goes in the other direction, inconsistent portion sizes can result in unhappy customers. Here is some help selecting a commercial portion control scale. Commercial foodservice portion control scales typically fall into one of two categories: mechanical or electronic. But before you decide which is best, you must first determine whether or not you need a “legal for trade” scale. Legal for trade scales are the most accurate scales, extensively tested and certified by the National Type Evaluation Program (NTEP). In many states, they’re required in operations like delis, produce markets, bakeries, and fish markets, where food products are sold by weight. The electronic versions may feature easy to read displays, label printers, and programmable keys for quick SKU lookups. You’ll pay for the advanced features and the certification. Many manufacturers also offer bowl platforms for items such as berries and dry goods. You can also find platforms that hold specialty items like French fry bags, taco shells, or even ice cream cones. If budget is an issue, then a mechanical portion control scale with a dial display may be your best bet. Some chefs even prefer them. Why? They are completely portable and don’t require rechargeable battery packs, AC adapters, or electrical cords. Both the tare and zeroing functions involve simple manual adjustments. Some commercial grade mechanical scales are dishwasher safe and some have removable platforms for easy cleaning. Platforms come in a variety of configurations to suit your needs. You might also want to look for a scale with damped springs. This feature prevents the platform from bouncing up and down repeatedly while you wait for a final reading. Whether you choose an electronic or mechanical portion control scale, make sure it is certified by the National Sanitation Foundation (NSF). Certification means that a third party testing group has evaluated the scale and determined it safe, unable to harbor bacteria, and very easily cleaned or sanitized. NSF certification is usually a requirement for scales used in professional foodservice establishments. 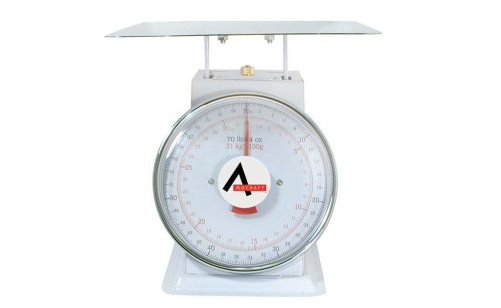 To help you when selecting a commercial portion control scale for your operation, see Adcraft, Edlund, Franklin Machine Products, Globe, Rubbermaid, Taylor, Update International, and/or Winco.